The Spanish Mastiff (Mastin Espanol, Spanish Mastin) is classified in the Working group of dog breeds. 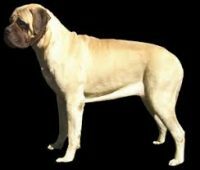 Within that group, it falls in the Molosser sub-group, and possibly the Mastiff subgroup, though according to some classification systems it is not a “true” mastiff, despite the name. It is a Livestock Guardian Dog (LGD) breed. There are two main types of these dogs: the Heavy Mastiff (Mastin Pesado) and the Light Mastiff (Mastin Ligero). These are not themselves separate breeds, but are variants of the same breed. The ancient Molosser shepherd dog existed as a breed and worked alongside nomadic herdsmen since the Neolithic era. Modern Molosser breeds are believed to have all descended from the original Molosser breed. The Spanish Mastiff likely descended from Molossers brought to the Iberian Peninsula (Spain and Portugal) by Phoenician tradesmen thousands of years ago. Note that the breed was not bred to herd sheep and other livestock, but to protect them. The dogs accompany flocks, always on the lookout for predators. When confronted with an enemy—wolf, human, or otherwise—they typically do not attack, but growl and bark menacingly to scare off the threat, as well as to issue an alert to the herd of the presence of the threat. But if the enemy is not dissuaded and attempts to in any way harm or interfere with the herd, the dogs will fight fiercely, even to death. In Spain, when working to protect herds they have sometimes been outfitted with thick metal collars with spikes to make them more dangerous to wolves and other predators that they might tangle with. This is an uncommon breed of dog around the world, except in Spain itself, where it is highly popular. There are tens of thousands of these dogs in Spain, making it the most common native Spanish dog breed in the country. In fact, it is the national dog breed of Spain. Though the breed has existed for millennia, it was only formally recognized in the 20th Century. The Fédération Cynologique Internationale (FCI), or World Canine Federation, issued its first standard for the breed in 1946. The Spanish Mastiff is an enormous dog, with an enormous head. Adult height is 28 to 35 inches. Males of the breed generally weigh 185-220 pounds, though they can grow larger. Females tend to be 40-50 pounds lighter than males. This breed is the heaviest of all the LGDs. It is a powerful, muscular, broad-chested, robust animal. The fringed tail is carried low. Its hind feet have double dewclaws. It has a deep muzzle, triangular drop ears, and a dewlap on its neck. It is a heavy drooler. Its eyes are watchful and vigilant, but the dog has a more confident, relaxed look to it than an excitable, frantic one. Its semi-long coat is straight, with a heavy under-layer. Common colors are fawn-colored, black, reddish or reddish-brown, gray, brindle, or spotted. It sheds year round, especially heavily twice a year. It has a loud, deep, low-pitched bark. Spanish Mastiffs are generally calm and not too demonstrative, though they will fiercely, courageously fight to protect the people or animals they feel responsible toward. They are intelligent and often described as dignified or aloof in their bearing. They are very loyal and loving dogs, but have a stubborn streak if not trained with firmness and consistency. In addition to protecting livestock, by nature, these dogs are well suited to being guard dogs, being watchdogs, and working with the police or military. Bred in Spain for both hot, desert conditions, and cold, snowy winters, they can tolerate a wide range of temperatures. They are more apt to struggle with high humidity heat than with dry heat. The breed’s need for exercise is average. Its size renders it generally inappropriate for apartment living. By temperament, these dogs tend to be good with children and other pets, especially if well-socialized when young. However, due to their sheer size, they can inadvertently injure young children, so caution is advised. They are slower to reach full maturity than most breeds, growing until about age 3. Life expectancy is typically 10-11 years.